Human wasn’t created for an observation of how well we performed. The Creator’s Intention was to witness the Power of Unconditional Love. When we Create Love for the Sake of Love, our Human limitations would no longer apply. Creating for the Divine Intention of Love, our Dreams would be manifested by the Creator’s Meaning and Purpose for our Life. We were meant to know that our most prized experience of Living was within our Power to Create for our Self. Monkey’s real joy is not in a manifestation, but in the actual Process of Creation. The Joy of painting a work of art lies in the Inspiration that guides each stroke of the brush… the Divinity of Seeing something before it was actually there. CHUEN inspects the Cause and Effect. It tries things just to see what happens. CHUEN holds an affinity with the Unconditional Love of the Dog. One associates Happiness with the Exchange of Love, Conscious of Life’s experiences of Love. The other associates Love with Beauty and the Power to Create it. The Cherokee Raccoon is a friendly trickster that coaxes a smile. Raccoon sees the Beauty of everything. We can learn something from the Raccoon about the Beauty we discarded with the trash. Human tosses Beauty away because we fail to look beneath the surface. Raccoon knows all things can be shined up with a little water. When we throw away experiences as unworthy of our Love, Raccoon makes its haul of all the perfectly good stuff we threw away. CHUEN sees the possibility that an experience of darkness can be totally transformed by a simple brushstroke of Light. In fact, darkness will make the Light appear even brighter. We can’t change how others see things. We can only change our Self. We can’t make people love us, but knowing what people Love we can still create the experience of Love. Humans are particularly fond of our Freedom. We were also given an eye for Beauty. We can’t force anyone to Love. Creating Love to leave behind, Human’s eye will be drawn to the Beauty sooner or later. Monkey/CHUEN is known as the Weaver of Time. The glyph illustrates Time rolled up on the Monkey’s head. Monkey Knows that Love holds the Promise of its Time. “Every Dog has its day.” Love will wait for eternity to be Seen and Acknowledged. So, it really is as simple as this… to Create Love, Imagine Love. Look for Love and you will discover Love. Discovering Love that was overlooked, only Multiplies the Love we see. To Create Beauty, imagine the potential for Love in everything that has ever been touched by the Creator’s Hand. The proof lies in the Beauty all Around Us. If we can’t see Love, we’re either walking around with our eyes closed or we’re focused on the dark thread that only separates one experience of Love from another. Monkey is said to never finish anything. We could never finish seeing all the Love that one experience could hold. The Love we create isn’t seen all the time. Yet, we are promised a Divine Destiny where all the Love we created will finally be seen All Together. Our Divine Destiny is the Time and Place where our eyes will be opened to all the Unconditional Love that was ever given… Love that was willing to wait to be Seen. Monkey holds the Element of Water, the substance that holds the Ether of our Spirit. CHUEN holds the potential for mystical experiences of Love. CHUEN can pull Love out of thin air from the Light all around us. CHUEN can go back in time to re-experience Love that was offered yesterday, and can travel to the future where that same Love still shines in the future. To all my relations, may we hold in our imagination the Love we Long to Create. May we know that all the Love we Create without any conditions, will shine an eternal Light. Instead of focusing on what we don’t want, may we Create what we Do Want. Love must always be a Choice. We have to Know the Choice could never be too late. When we Create Unconditional Love, the door is always open for a Divine Time and Place. What kind of Gift would Love be, if we grabbed it back when the reaction wasn’t what we expected. We’d have created more happiness by not giving anything at all. May we see our own clear way forward, creating Love that can never be diminished by the Time it takes for the Sacred Exchange. May we know that Unconditional Love holds the magic of Divinity, infinite and eternal, stored up for All Time. May we know that our Creation of Love will always be seen in its most Beautiful Light when it is created for All Time without Conditions. May we do a little digging through our own trash to see the opportunities for Love we discarded or gave up on. May we remember that given enough time, even a lump of coal can be transformed into a diamond. Our Creation of Love is always guaranteed. It’s only a matter of the Most Divine Time when Love will be Seen and Acknowledged as a Miracle made possible by the Hand of the Creator. May we hold faith in our darkest day, believing in the new Light promised by the Solstice. May we believe in the Spring, when our Hearts are naturally turned to Love by a new experience of Beauty and Life emerging into the Light. May we know that Beauty begets Beauty, Love begets Love, and Light begets Light. 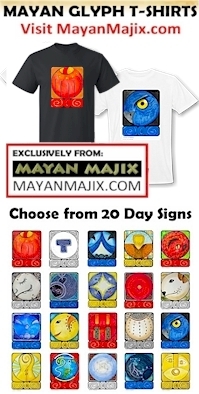 TIME-KEEPING UPDATE: The “Mayan Observances” in the sidebar has been updated with the Haab New Year, the preceding dates of the Wayeb, and Global Burners for 2019. Cherokee, Raccoon/KVH’LI: Star Symbol: Algol, a star in Perseus. Restless energy yearning for long-lost love. Algol was named DEMON STAR or MISCHIEVOUS ONE by the Ancients because it winks and fades at times. Raccoon is full of friendly mischief, eager to swap kisses for candy. Magnetic leaders, full of humor and gaiety. Favorite food is corn, the mainstay of the Cherokee. Very artistic while being the “masked bandit” who steals your heart. “This is horrible! Here — taste it.” Hahaha!! Priceless!